"The following is not a joke patent," says the priority claim of U.S. Patent No. 8,011,991 B2. "Its [sic] completely serious and is a serious undertaking to obtain a patent." That may be (and it was successful), but it's also one of the more entertaining patents I've seen, which is saying something. This one, though, is unusual because of the quality of the writing involved. There is the occasional typo, but look past that in this case because this is good stuff. Sure, you know how to make a snowman, but can you make a perfect one? This has always bothered Mr. Asperas. "You can never make a perfect snow man," he laments. "The snow balls are never, and I mean never, perfectly round. They are always lop-sided and look sort of doofy." 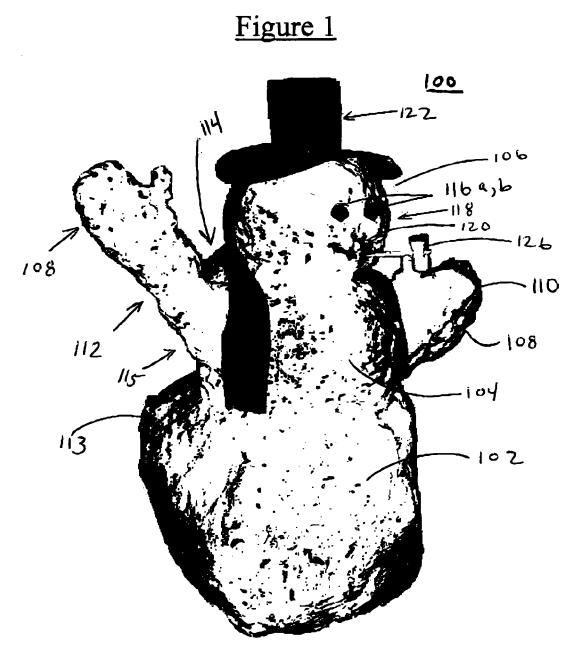 As an example, he included Figure 1 (right), which is a snowman made the "old-fashioned way." He was quite proud of "Frosty," he said. "I think one can say that I have advanced the art here," but still Frosty has problems. For example, Frosty "has quite a large caboose 113 on his trunk 102. In less politically correct terms, his behind is quite large. This is the result of not being able to roll the snow ball evenly," which Asperas notes is "quite impossible." But then genius struck, he said. What if someone could make a snow boulder that is perfect every time. 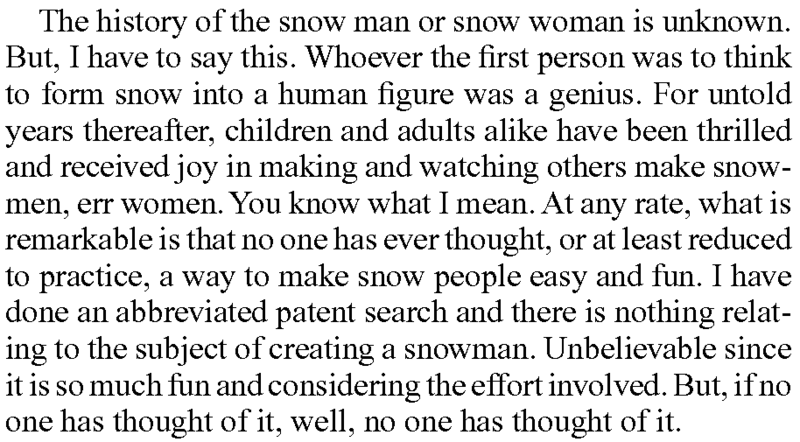 A snow man that could be replicated so that it looks the same each time, each year…. What if someone could make that out of a light weight, abundant material that is cheap and is practically used in all toys? What if a really big snow man could be built utilizing the bare minimum of snow? 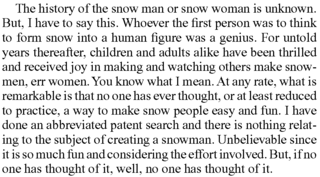 The patent then sets forth a method of making a snowman, and an invention for that purpose that involves a hollow sphere into which the snow is apparently packed. There is also a rather elaborate and possibly ingenious method for using an electrostatic charge to help get the snow to adhere to the inside of the device. One aspect of the invention involves a limit on the maximum charge that could be formed by the generators because "[i]t would not do to zap little kiddies. I am sure it would not harm them, but I am thinking of greedy product liability attorneys." "So there it is," the summary concludes. "My new and improved method and apparatus for building a snow man (woman). OK. Snow woman (man). There." Yes, there it is. One of the few comical patents I've seen that, rather than being merely crazy or outrageous, is also a truly entertaining read.